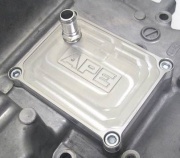 APE alternator block off plate. replacement ally cam end plugs,wont blow out! Heavy duty gsxr1300 slave cylinder spport kit. APE Trick Lightweight Cover Bolts,c/w o rings.